Anyone remember when you were a kid and you hated eating vegetables? And your mom or dad would always make you eat something green because that’s the color of vegetables? One time I got away with eating pistachio salad just because it was green (it’s not vegetable related AT ALL!). I’m taking that concept for today’s picture. This leaf is not autumn colored because it’s autumn. It’s that color because it’s dead and caught in the branches of the tree. But, just like having to eat something green colored, this one is close enough for me today. LOL…OMG, you are too funny! I think that the story is just as fun as the photo! Love it! 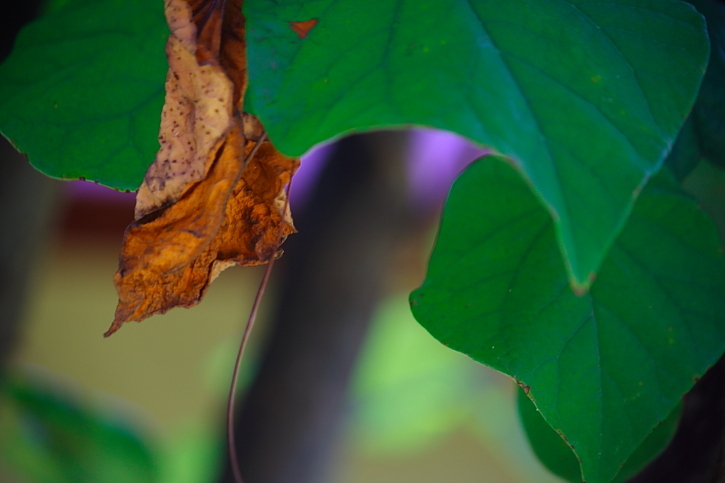 Okay, Daniel asked about the purple haze under the leaves. My response was, “what purple haze?” I really hadn’t seen that before he mentioned it. There’s a window there, and I guess someway it’s reflecting purple. I took 4 pictures and it was in all of them. Love the purple accent! WTG Dan for pointing it out! Sometimes you just gotta go with some Jimi Hendrix. Purple Haze…get it? Oh nevermind. Let’s just say it was very prevalent on my phone browser.